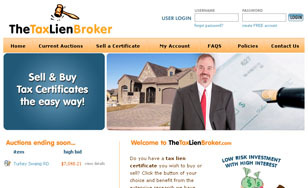 This auction website is for people who wish to buy or sell tax lien certificates. The New York web design by Bitochon features a database E-commerce capability where sellers can login and post auctions and buyers can bid on certificates currently up for auction. When a user participates in bidding on a certificate they will receive notifications when they are outbid and who is the winning bidder when the auction ends.